As colleagues and friends, the members of Charm of Finches have been swooping in and out of each others’ lives for more than a decade. Their shared connections include hometowns, high schools, universities, training orchestras, and now Canada’s professional arts landscape. The Finches are active soloists and chamber musicians in their own right; their performance history extensively covers Canada and the US, as well as Asia, and performance venues stretching from the forests of Haliburton, Ontario to Carnegie Hall. The Finches’ shared love of the flute’s orchestral repertoire is reflected within their individual careers. They have had the privilege to perform and/or hold positions in ensembles such as the Canadian Opera Company Orchestra, the Kingston Symphony, the Niagara Symphony, the London Sinfornia, the Ontario Philharmonic, the Kitchener Waterloo Symphony and the Esprit Orchestra. This passion has informed the group’s repertoire which includes nuanced quintet arrangements of orchestral masterpieces. They also find mutual inspiration in contemporary music. All members have been active in the premieres and promotion of new repertoire by both emerging and established Canadian composers. The group is excited to continue this pattern in the canon of FluteQuintet Repertoire. 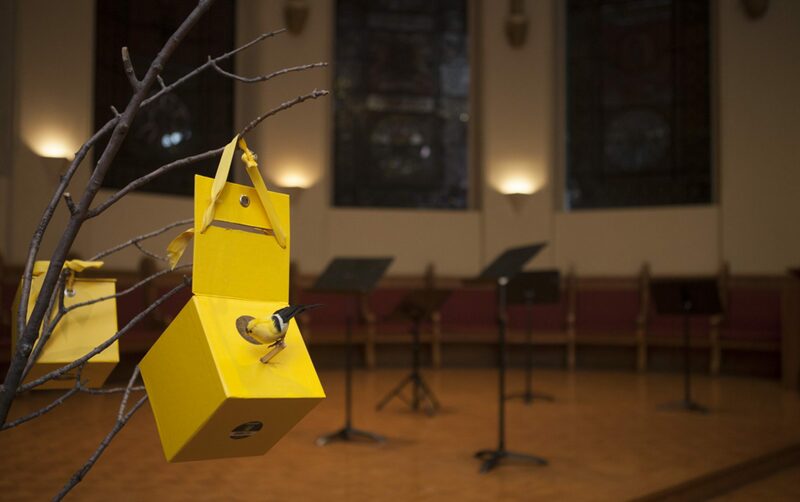 In 2016 Charm of Finches premiered two new arrangements for Quintet arranged for and dedicated to the ensemble as well as a brand new commission by Canadian Estonian composer Riho Esko Maimets.The groups’ collective history is enriched by a diversity of training from some of the world’s most prestigious flautists including, James Walker, Timothy Hutchins, Carolyn Christie, Douglas Stewart, Leslie Newman and Lorna McGhee. Charm of Finches are dedicated educators, with well-established private teaching studios, who bring their training and experience as guest artists in schools and summer music programs across the province. They hold degrees in performance from McGill University, the University of Toronto, University of British Columbia and the University of Southern California. Toronto born flautist Laura Chambers began her flute studies at the age of seven. She has since had the privilege of working with such artists as members of Nexus and composer Steve Reich. Ms. Chambers holds an Honours Bachelor of Performance from the University of Toronto and a Masters Degree from the Thornton School of Music at the University of Southern California where she studied under Professor James Walker. Previous teachers include Patrick Gallois, Susan Hoeppner, Camille Churchfield and Tara Helen O’Connor. Ms. Chambers has appeared as a concerto soloist, orchestral player and chamber ensemble musician across North America. As a player of modern, baroque and world flutes, Laura has been a featured soloist with the Mississauga Symphony, Toronto Symphony and the Kitchener Waterloo Chamber Orchestras, and a guest artist at the Glen Gould Studio, and Ottawa Chamber Music Festival. She has recorded for the Naxos label and award winning motion picture soundtracks. As an active member of the GTA freelance scene, Laura holds the position of principal flute of Orchestra Toronto and has appeared regularly with groups such as the Niagara Symphony and Orchestra London. Her diversity as a flute player has been further displayed during her experience in musical theatre in such shows as Acting Up’s March 2008 theatre production of a Man of No Importance in which she played over 13 different wind instruments. Tristan Durie is an accomplished ﬂautist who is very active as a performer and freelancer in Toronto. Recently he has performed with groups including The Canadian Opera Company, Esprit Orchestra, The Bicycle Opera Project, (performing at Toronto Summer Music, Stratford Summer Music and the Westben Festival), Soundstreams, Sneak Peek Orchestra, the Exultate Chamber Singers, the Casa Loma Orchestra and Musica Reﬂecta. Other notable performances include world premiers of both Gabriel Prokoﬁevʼs “Flute Trios” and Jonathan Harveyʼs “Vajra”, the Toronto Premier of Brian Harmanʼs “Surface” for Solo ﬂute at the CMC. Tristan has performed in masterclasses for many world renowned ﬂautists including, Emmanuel Pahud (Berlin Philharmonic), James Galway (Berlin Philharmonic), Mathieu Dufour (Chicago Symphony), Lorna McGhee (Pittsburgh Symphony), Philippe Bernold, Robert Langevin (New York Philharmonic), Peter Lloyd (London Symphony), Andras Adorjan (Baden-Baden & Munich), Jeffrey Khaner ( Philadelphia Orchestra), William Bennet and Trevor Wye. Tristan is the proud and grateful recipient of the 2014 and 2015 Arthur Plettner Graduate Fellowships, the 2010 James Craig Opera Orchestra Award, the 2009 Percy Faith Award, the 2009 and 2010 David and Marcia Beach Summer Study Awards, the 2010 Jean A. Chalmers Award as well as a CBC Radio Canada Galaxy award. He holds a both Bachelor & Master of Music Performance from the University of Toronto where he studied ﬂute with Leslie Newman & Douglas Stewart, and composition with Prof. Norbert Palej. He is currently completing his Doctorate in Flute Performance at the University of Toronto under the guidance of Prof. Leslie Newman. Described as “imaginative and magical”, Terry Lim is a multifaceted flutist known for musical risk taking and brilliant artistry. He received his Bachelor of Music degree with an international soloist, Lorna Mcghee, at the University of British Columbia and completed his Master of Music degree at New York University with a renowned flutist, Bradley Garner. Terry was also a former faculty member at the UBC Summer Music Institute and New York University. Terry has performed in various music festivals and concert series across North America, including Ottawa International Chamberfest, Stratford Summer Music, Toronto Summer Music Festival, Banff Centre, Redshift Society, Music on Main, New Music Edmonton and Pierre Monteux. He also has been heard on the radio and in concert halls throughout the United States, Canada and Asia, performing at the Chan Center, Kimmel Center, Carnegia Hall, DiMenna Center, Alice Tully Hall, and Merkin Hall. As an energetic proponent for chamber and contemporary music, Terry has created a dynamic force in the music world highly regarded for his music concerts of various styles and genres. He has worked closely with numerous composers and has given several world premieres. Terry is also a member of Toronto-based ensembles, Thin Edge New Music Collective and Charm of Finches. Besides performing, he maintains a private flute studio, delivering weekly solo and chamber music lessons, adjudicates festivals across Canada and appears as guest speaker in university classroom and festival panels. Amelia received both an Undergraduate and a Masters degree in orchestral performance at the McGill Schulich School of Music, under the orchestral tutelage of Carolyn Christie, Denis Bluteau, and Alexis Hauser. Previously she spent seven years studying with Beverley Robinson, and one with Robert Cram in Ottawa. In May of 2015, she won an audition for principal flute of the Kingston Symphony Orchestra and took up the position that fall. Her previous orchestral experience consists of work with the Kitchener-Waterloo Symphony, Sinfonia Toronto, Toronto Concert Orchestra, and Euphonia among others. Amelia spent four years as principal flute of the Ottawa Youth Orchestra, two years playing with the National Youth Orchestra of Canada, under the baton of Jacques Lacombe, and completed three summers with the National Academy Orchestra working with Boris Brott. In 2003 she won first place in both the Ottawa Youth Orchestra’s and the Ottawa’s Thirteen Strings concerto competitions. She has been the recipient of the Harold Crabtree Foundation Award and the Special Prize for Orchestral Excerpts in 2007 and the National Arts Centre Orchestra Bursary in 2008 from the NACO Bursary Competition. In November of 2009, she was a semi-finalist in the Montreal Symphony’s Standard Life competition in winds brass and percussion, and she has been invited to play as a soloist at the National Arts Centre on several occasions. Katherine Watson is an acclaimed Canadian developing musician that currently resides in Toronto. For the past half-decade, Katherine has established herself as one of Toronto’s emerging classical/contemporary flutists. She has premiered dozens of new compositions written for flute, has recorded live for CBC radio, as well as recorded for and appeared in films such as Pompeii (2014) and Brad’s Status (2017). Most recently, Katherine was invited on full scholarship to attend the Lunenburg Academy of Music and Performance in Lunenburg, Nova Scotia, to study privately with Douglas Stewart (Canadian Opera Company Orchestra) as well as the Legendary Robert Aitken, working with the composition studio to workshop and premier several new Canadian compositions along with TORQ percussion quartet and the Iris string ensemble. In the past year, Katherine has been performing with the Toronto Winds and is the newest member of Charm of Finches, Toronto’s own professional flute quintet. She regularly plays for the Lieutenant Governor of Ontario’s events, as a soloist with the Bach Children’s Chorus, and Fawn Opera. More recently, Katherine presented a concert/recital of contemporary flute works including Steve Reich’s Vermont Counterpoint, played back in surround sound. Last winter, Katherine performed with Continuum Ensemble’s Continuum in the Classroom project with the Toronto District School Board, as well as performing as a soloist for Soundstreams for a Salon 21 event at the Gardiner Museum. She also presented a concert featuring the music of Montreal composer Jason Noble and premiered her own composition for solo flute, Supermoon 2015, at Array Space. She recently obtained her Masters in Music performance from McGill University in Montreal, studying with Timothy Hutchins (Montreal Symphony Orchestra). Over the last couple of years in Montreal, Katherine has performed with several orchestras in the community, including Pronto Musica, L’Orchestre Symphonic de L’Agora, and L’Orchestre Point D’arrête, as well as appearing in many chamber recitals. She has participated in the Montreal Contemporary Lab’s New improvisation clinic, and performed in chamber and orchestral concerts in the Bathurst Music Festival in New Brunswick.